The annual FLTA awards represent the industry's foremost recognition of engineering and design excellence. 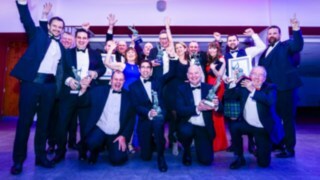 Held to celebrate the best companies within the fork lift truck sector, the awards aim to set the bar for higher standards throughout the industry, from apprentices to senior teams, and manufacturers to ancillary equipment suppliers. 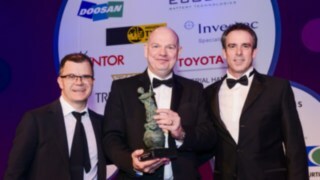 Linde’s new T20 SR electric rider stand-on pallet truck received an award for Ergonomics at this year’s awards ceremony. Linde’s new model offers significant improvement in comfort for trucks used in environments where the operator is frequently subject to shocks and vibration. The truck is extremely compact; only 770mm wide, and is ideally suited for lorry loading and unloading across dock levellers. It is also designed for pallet handling in areas of restricted space. The unique, fully suspended operator compartment, drive motor and operator backrest are separate from the chassis, which has resulted in a 38% decrease in whole body vibration. This enhances operator comfort and reduces levels of fatigue during the working day. Four apprentices from Linde’s Apprentice Programme were also shortlisted for the Apprentice of the Year Award, with Linde apprentices winning both winner and runner up awards. 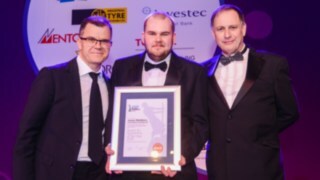 Jeremy Caddick, senior director of aftersales at Linde Material Handling, said: “I’m proud and honoured to see our incredibly talented group of apprentices recognised for their excellence at the FLTA Awards ceremony. "Congratulations to James and Oliver for their achievements – the awards they received reflect the hard work and effort they both put in every day. "To see four of the six shortlisted apprentices of the year come from the Linde Apprentice Programme and to be crowned both winner and runner up this year is testament to the exceptional quality of our programme and our apprentices themselves."